Children's laughter spills out of two large tents, a surprising sound in this dusty, harsh landscape of Iraqi Kurdistan. 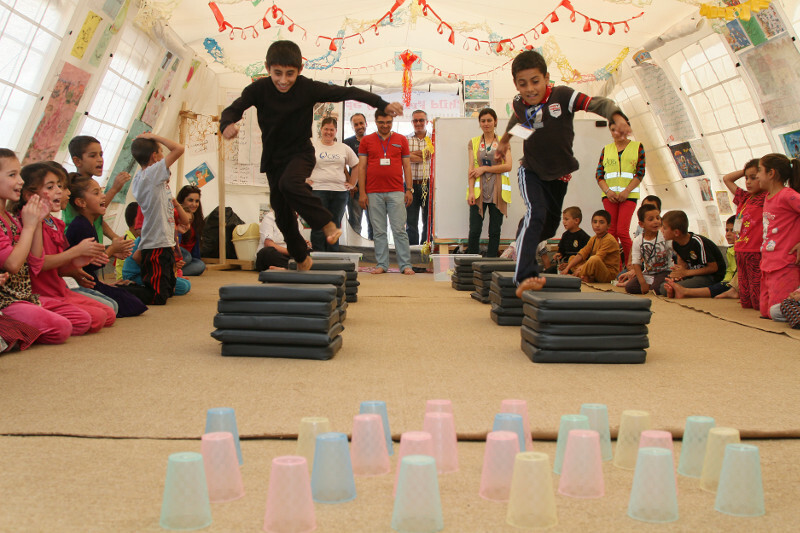 Inside the tents—each about the size of a classroom—dozens of kids are at play, their raucous energy barely containable. During a relay race, pairs of youngsters take turns jumping, leaping and hopping over stacks of seat cushions doubling as hurdles, while their teammates cheer them on. 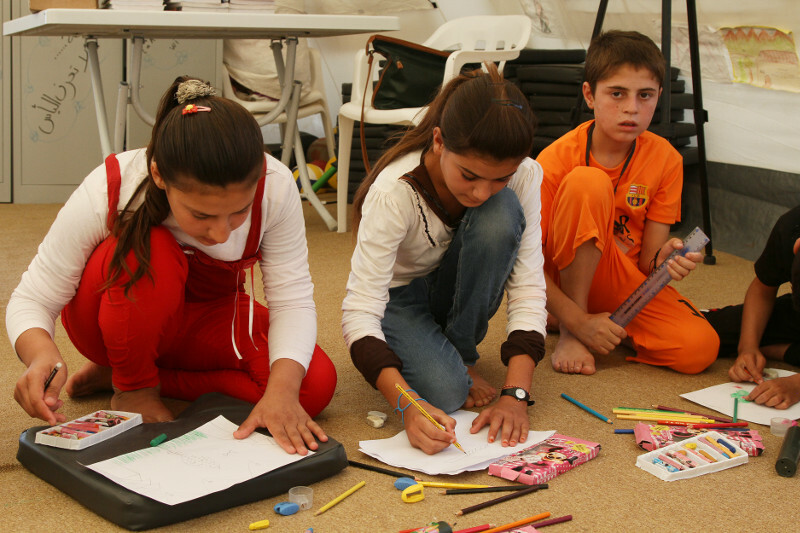 These tents—with their wall-to-wall decorations and colorful drawings—are child support centers where, thanks to Catholic Relief Services and Caritas Iraq, more than 2,000 Iraqi children find a bit of structure and normalcy in their disrupted childhoods. One of them is Nariman Chamo, 11, a reserved yet amiable girl with long brown hair and a slight smile. Among her favorite activities: drawing, coloring and playing games with the trained volunteers who provide recreational activities and mentoring. "It's very useful for our children because it keeps them busy and it's a nonstop learning process," Nariman's father, Hussain Chamo says. Nariman, like many of the children who attend the centers, experienced significant trauma when her family was forced from their home by ISIS in August 2014. They fled on foot when ISIS fighters attacked their village in Sinjar district, about 100 miles west of Mosul. According to news reports, hundreds of Yazidis were massacred during the onslaught. Although Nariman's family, Yazidis themselves, were spared that fate, they were trapped on Sinjar Mountain for 8 days without food or water. Nariman's mother, Klocher Mhe, 34, describes the family's desperation with tears in her eyes. "We left with just the clothes on our backs and our children in our arms," she says. She watched her six children slip in and out of consciousness because they were hungry and dehydrated. She says that each day is still like a new nightmare: They continue to live in fear that ISIS will take them away. "I do whatever I can to make my children feel comfortable, but I can't fully hide my fears," Klocher explains. However hard their lives have been and continue to be, the family is thankful to have the child support centers, which have become places for healing. "Whenever I see a smile on one of their faces, I know that deep down, everything is going to be OK," Klocher says. "It's like God has given us a second chance at life." She adds, "The most important thing for my children is their education." 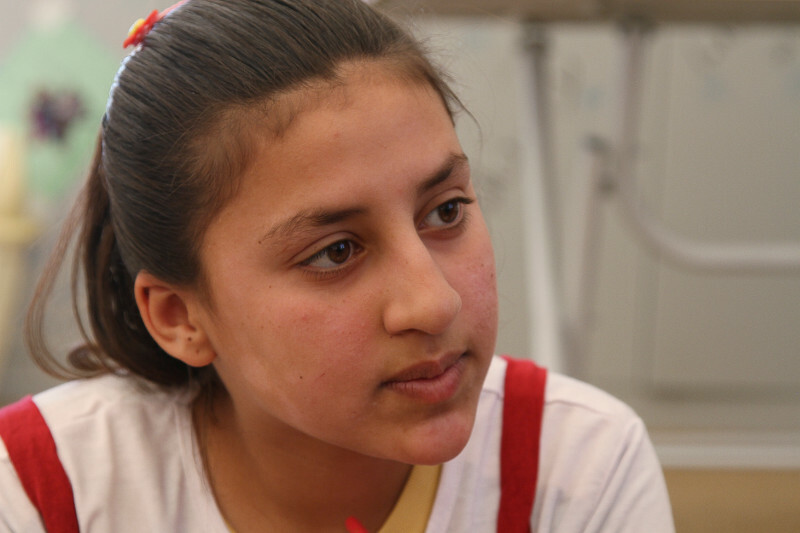 Education in Iraqi Kurdistan is hard to come by for those who have been displaced. It's estimated that about 65% of displaced children do not attend school because there is no space for them in classrooms. Hundreds of schools in the region double as emergency shelter for thousands of displaced families. To fill the education gap, CRS is transitioning to teaching a formal curriculum at the child support centers. "The goal is to ultimately get kids enrolled in school," explains Courtney Lare, who oversees the project for CRS. "We intend our child support centers to be a bridge back to a formal education." CRS opened its first child support center in December 2014. Seven are currently operating, with plans to open more in coming months. Each child attends a center for 3 hours, twice a week. In addition to CRS private funds, the project is supported by the Canadian government and the Canadian Catholic Organization for Development and Peace. It's not just children who benefit from the project. Once a month, mothers' and fathers' groups hold meetings at the centers to provide feedback to the mentors and to talk about what more can be done for their children. Nariman's father, Hussain, says the impact of the child support centers on his children is evident. "When they come home … they practice what they've learned," Hussain says. "I've seen so much change on their faces." As for the future, Nariman hopes to become a doctor someday. However, her mother can only think about the family's day-to-day struggle to survive. "We are a very peaceful people," Klocher says. "We don't deserve what we've been through. Nobody deserves what we've been through."